MdCV FFA past and present officers: Kayden Dickey, Leon Sluder, Alaina Marsh, Dalton Hook, Brookelyn Janssen, Destiny Massey, Josey Weimer, Chloe Volkman, Kali Holt, and Kathryn Vaught. The annual Marais des Cygnes Valley FFA Chapter banquet was held on Thursday, April 13, 2017. 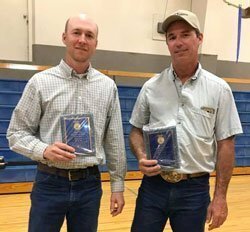 Approximately 90 people, including members, family and friends, gathered in the Marais des Cygnes Valley High School gymnasium for some good eating, door prizes, awards, and the installation of the 2017-2018 chapter officers. The invocation from Dalton Hook was followed by the dinner of pulled pork, roast beef, cheesy potatoes, side dishes, and desserts provided by our members and their families. Then, we handed out door prizes from local supporting businesses. MdCV FFA honors Mark Lacey and Shane Weimer with the Blue and Gold Award for their assistance with the club’s greenhouse floor. Following the dinner, chapter officers President Kayden Dickey, Vice President Kathryn Vaught, Secretary Josey Weimer, Treasurer Dalton Hook, Reporter Leon Sluder, Sentinel Chloe Volkman and advisor Danny Rice began the opening ceremonies. Kathryn Vaught then introduced our guest speaker, Lori Harlan, a former state vice-president and MdCV alumni with her speech on the countless opportunities that FFA provides. 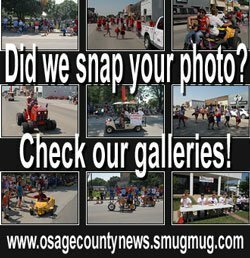 Other guests included members of the USD 456 Board of Education, USD 456 Superintendent Ted Hessong, MdCV Junior High/High School Principal Michelle Schulze, members of the MdCV Ag Education Advisory Board, Joe and Shirley Lichtenauer, Dale and Peggy McCurdy, Jeff and Merrilyn Casten and family, as well as FFA members and family. After the guest speaker, Chloe Volkman and Josey Weimer presented the chapter video showcasing the year’s activities. 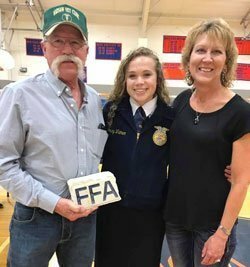 Don and Kelli Dickerhoof are recognized as supporters of MdCV FFA with a special award presented by Josey Wiemer. The chapter awarded Greenhand Degrees to Grace Bradley, Kaelin Criqui, Tristen Duncan, Ryan Gosser, Carson Jones, Bayleigh Lacey, Haylee Miles, Koby Vanderpool, Frank Warner, and Rebecca Bialek. The Star Greenhand award recipient was Bayleigh Lacey. Following the Greenhand Degrees, the Chapter Degrees were awarded to Nocona Brinkley, Brookelyn Janssen, Destiny Massey, Kathryn Vaught, Chloe Volkman, and Alaina Marsh. 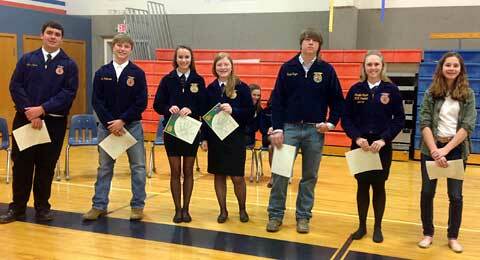 Awards were given to members with outstanding supervised agricultural experience programs. Proficiency awards were given to Leon Sluder for sheep production and also small animal production, and Kali Holt for veterinary science. Each year, MdCV FFA gives out scholarships to seniors attending technical, two-year college or four-year university, and this year’s recipients were Kayden Dickey and Leon Sluder, who received the Lichtenauer Family Scholarship and the MdCV FFA Chapter Scholarship. 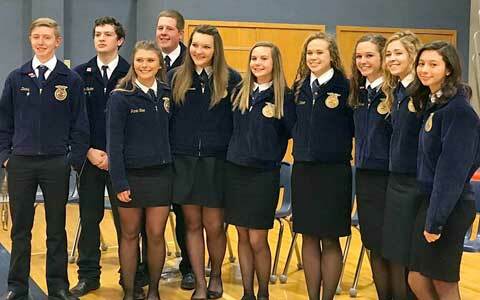 The chapter recognizes outstanding individuals or businesses that go beyond to support the FFA chapter. This year’s Blue and Gold Award went to Shane Weimer and Mark Lacey for their assistance in the planning and pouring of the greenhouse floor. 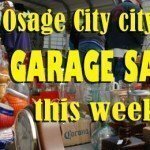 Other contributors to the greenhouse were also recognized including Jones Fund, Monsanto, Dupont, USD 456 Board of Education, Sam Flatin, Kelli and Don Dickerhoof, Stinebaugh Memorial and Jill Casten. Danny Rice announced members that would be attending the Washington Leadership Conference in Washington, D.C., this summer. Scholarships are awarded through the Kansas FFA Foundation from Jeremy and Emily Lehning, $1,300, and the Casten Family Memorial, $500. The recipient of the Lehning Kansas FFA Foundation Scholarship was Brookelyn Janssen, and the recipient of the Casten Family Memorial Scholarship was Kathryn Vaught. Wrapping up the awards ceremony, the Sweepstakes Awards were given to Josey Weimer, first, Kali Holt, second, Chloe Volkman, third, Kathryn Vaught, fourth, and Brookelyn Janssen, fifth. For the Greenhands, Bayleigh Lacey was first, followed by Haylee Miles, and Tristen Duncan. As the chapter banquet came to a close, it was time to install the 2017-2018 MdCV chapter officers. 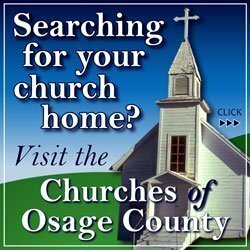 The new officers are President Josey Weimer, Vice President Dalton Hook, Secretary Chloe Volkman, Treasurer Kali Holt, Reporter Kathryn Vaught, Sentinel Alaina Marsh, Historian Brookelyn Janssen, and Student Council Representative Destiny Massey. MdCV FFA would like to thank the businesses and people who donated door prizes and food. Special thanks go to everyone who came to support our MdCV FFA Chapter. Greenhand Degrees were presented to Frank Warner, Koby Vanderpool, Haylee Miles, Bayleigh Lacey, Carson Jones, Tristen Duncan, and Grace Bradley. Not pictured, Kaelin Criqui, Ryan Gosser and Rebecca Bialek. 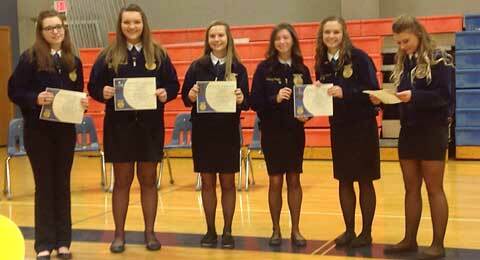 Chapter Degrees were bestowed on Nocona Brinkley, Brookelyn Janssen, Destiny Massey, Chloe Volkman and Alaina Marsh.